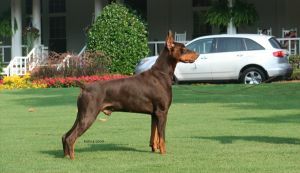 Titan is a line bred son of BIS BISS Ch. 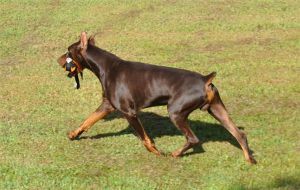 Brunswig’s Cryptonite (a.k.a. 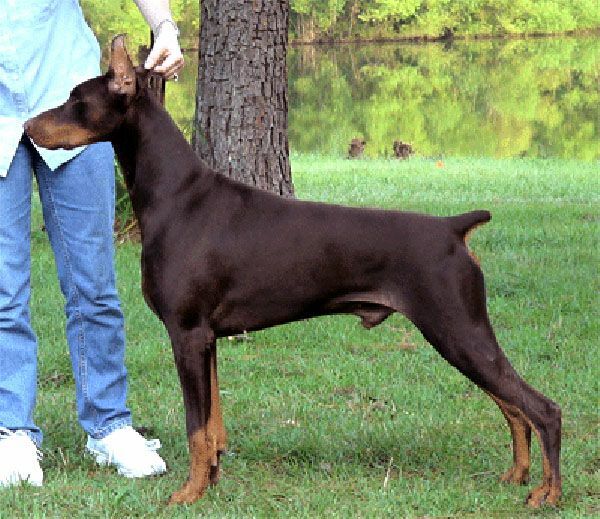 Kafka) – out of Cambria’s Irish Rose. 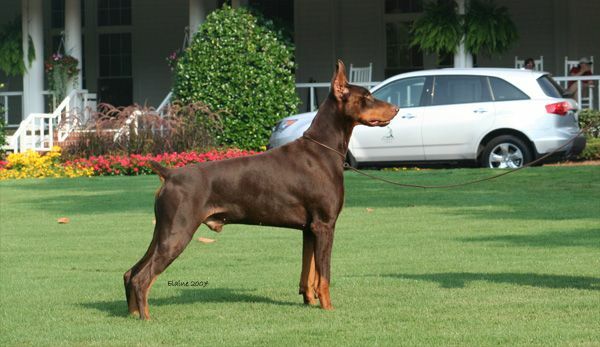 Titan was bred and owned by Logres Farm. He and his littermates were the heart and soul of the farm. 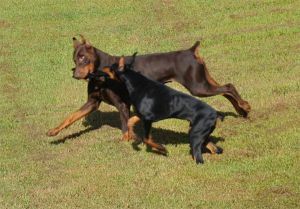 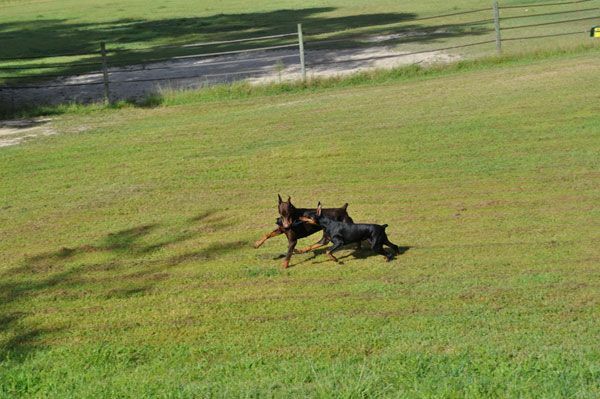 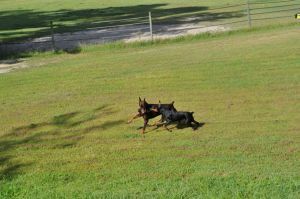 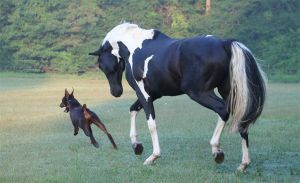 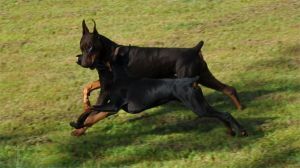 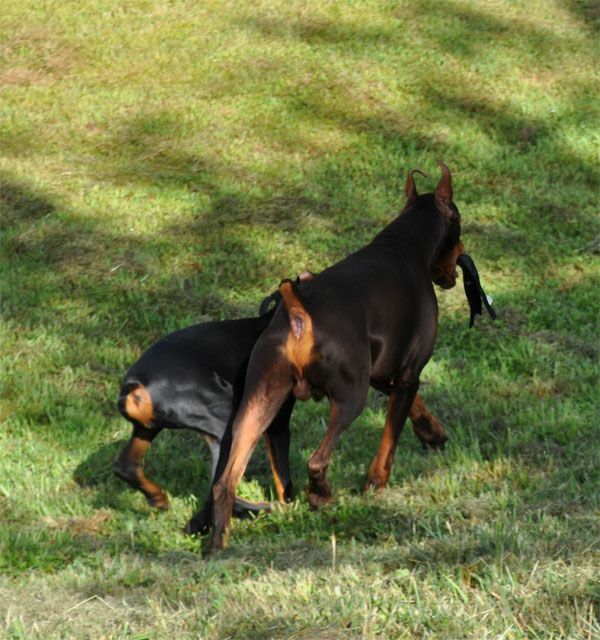 Titan in particular embodies so many of the attributes the Doberman breed needs, as much in 2013 as when Kafka was alive and dominating the show rings and breeding almost twenty years ago. Titan’s sire – the immortal BIS BISS Ch. 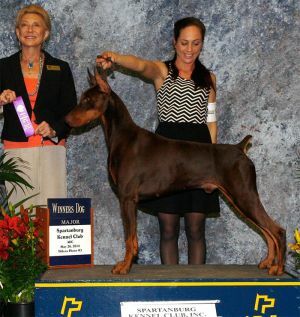 Brunswig’s Cryptonite (a.k.a. 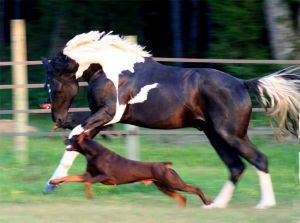 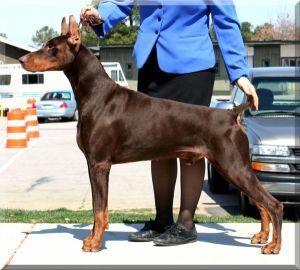 Kafka) was – without question, the greatest show Doberman and sire that ever lived. Though the old handler George Murray is often associated with Kafka, George had nothing to do with producing this amazing dog. Kafka was bred by Phyllis Farrier, finished by Perry Phillips and backed by a wealthy patron of dogs – Mr. Sam Lawerence. 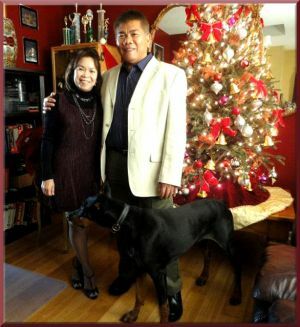 We had the honor of speaking with Mrs. Farrier a few years before her death, she spoke highly of Mr. Phillips and expressed pleasure in the quality of Titan. 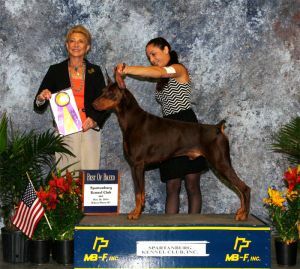 As many Doberman aficionados know, Kafka retired from the show ring as the TOP WINNING Doberman of ALL TIME, the Top Winning Working Group Dog of All Time, and one of the Top Winning Dogs All Breed – of All Time. 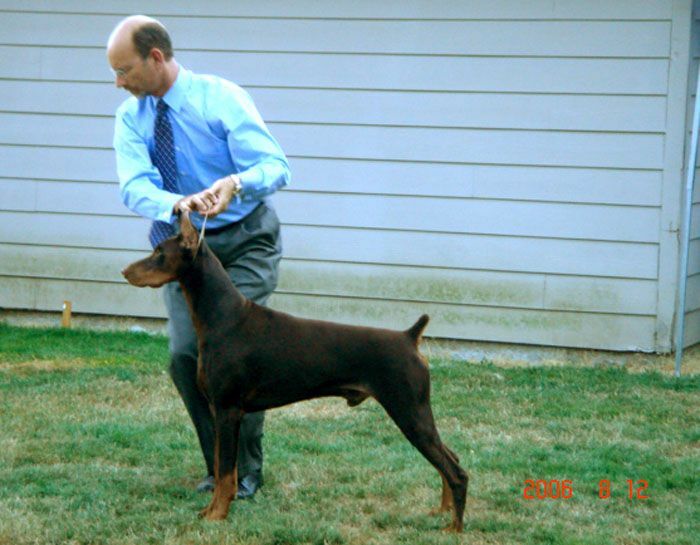 No Doberman has ever really come close to equaling Kafka’s record as a show dog, but even more amazing, Kafka was also a superb sire. For many years he was the TOP Doberman sire in Breed History (a record that has been eclipsed by his grand son Ch. 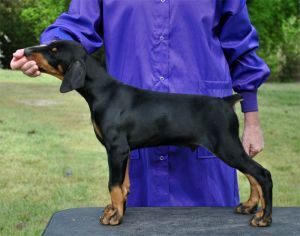 Cambria’s Cactus Cash). Titan is Kafka’s son, out of a Kafka granddaughter who goes back to Ch. 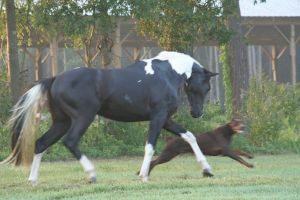 Cambria’s Cactus Cash through Ch. 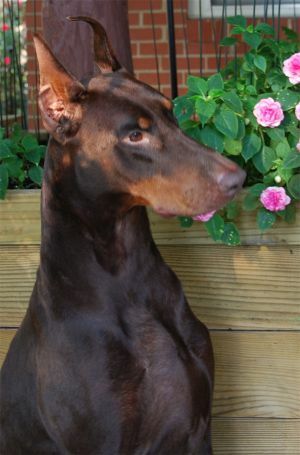 Orion’s Rasberry Beret. 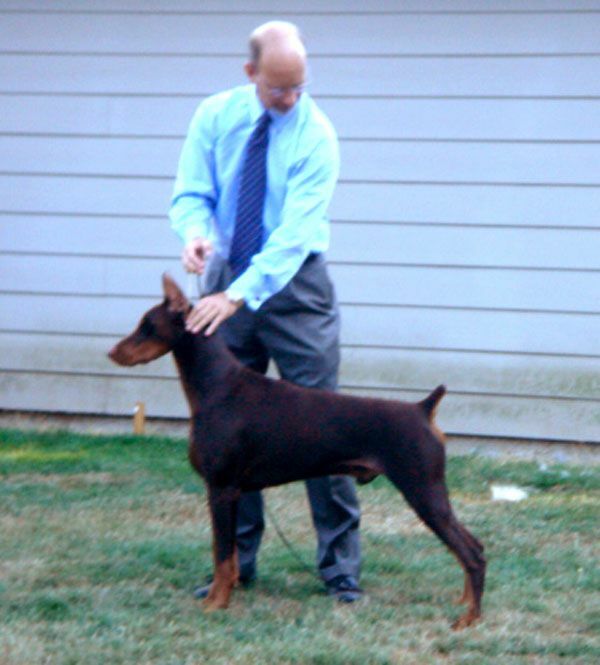 It is true that Titan could have used a better return of the upper arm, and he did not have the overdone wheelbarrow forechest that has become popular in our show rings in recent years. 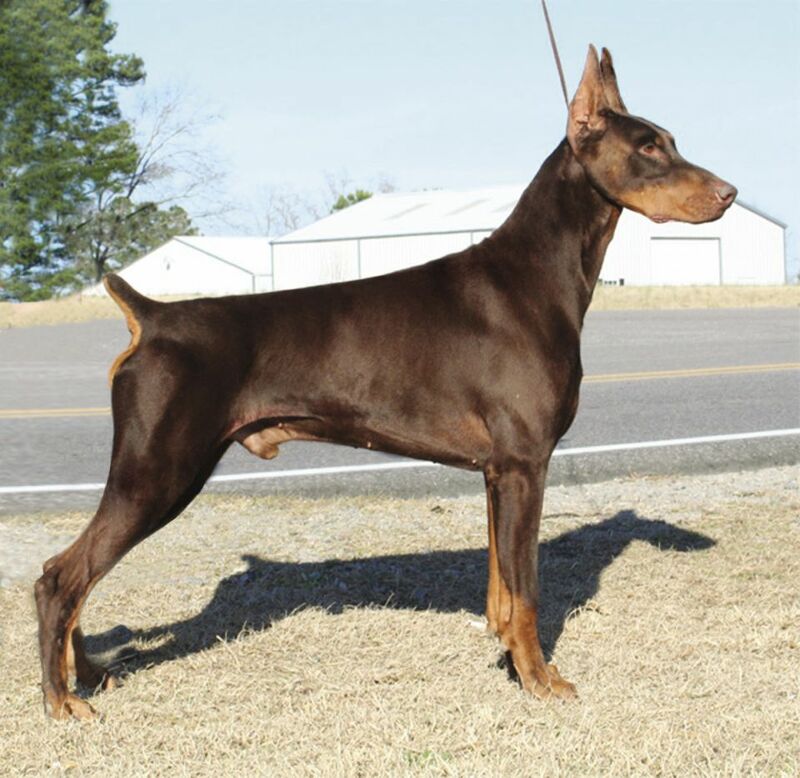 Rather, he was a correct and magnificent dog, with a beautiful topline, strong lion connection, correct croup and tail set… reminiscent of the best of his pedigree, like his sire Kafka and his grand sire – Ch. 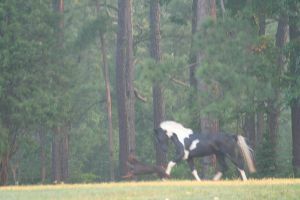 Electra’s the Windwalker. 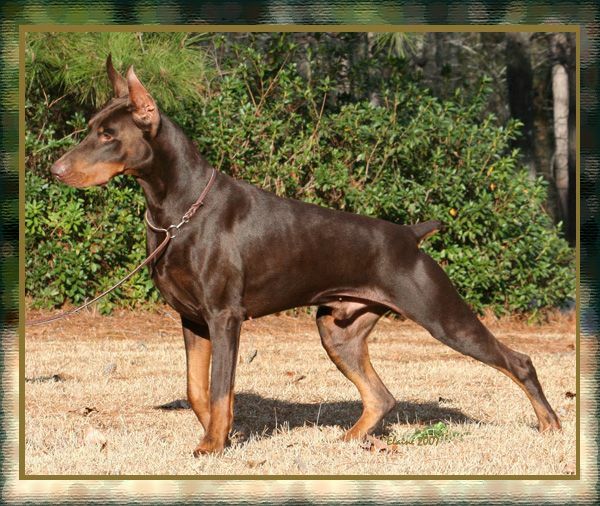 Titan had incredible structure, pedigree, and the very best movement. In recent years DPCA breeders have chased after “the dog of the moment” (that some handler recommended), and/or sought to replicate the over-angulated out-of-balance distortion that appeared from abroad, with the grossly over done front assembly and a rear like a German Sheppard). 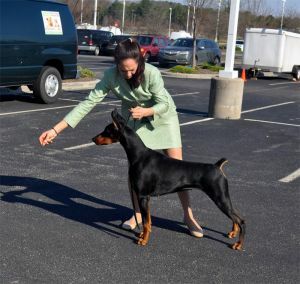 In doing so they utterly ignored correct toplines, strong loin connections and superb tail-sets, and a strong driving trot, which are traits a correct Doberman must have. 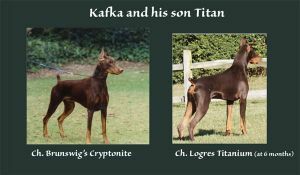 Titan was prepotent for these traits. 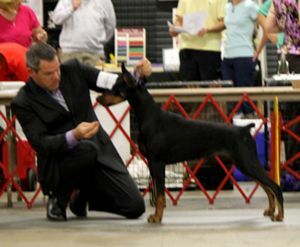 In December 2, 2006 Logres’ Titanium and Kelly Marquis became a team, in two weeks Kelly had Titan finished!!! 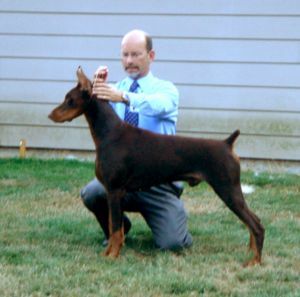 We allowed Titan to be bred once, to Logres’ Butterfly Flip (our spectacular Trotyl – Logres’ Brentina daughter). 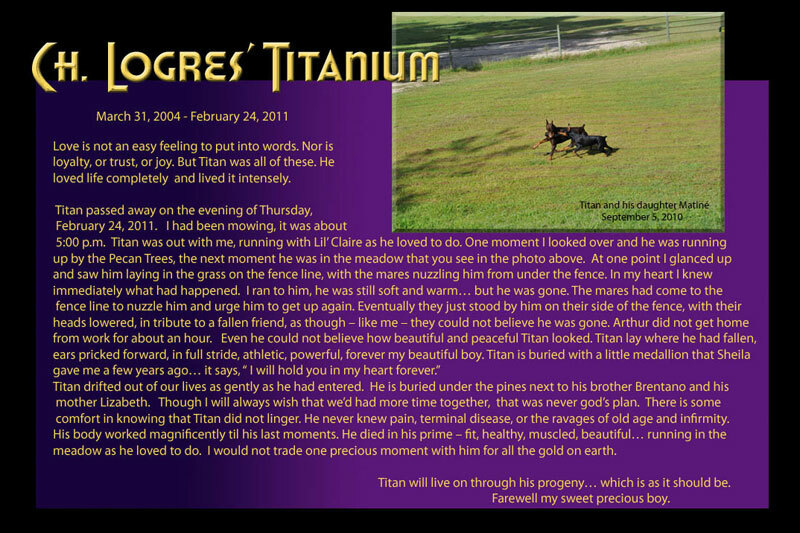 We treasure the litter that Titan left us. 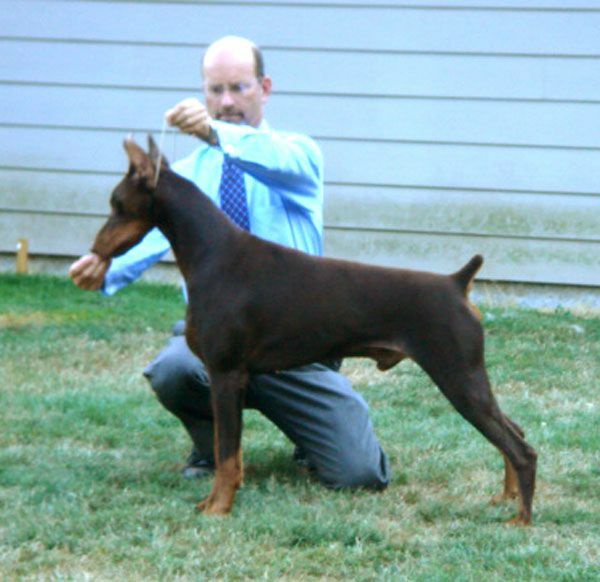 His legacy reflects correct structure, outstanding movement and timeless quality. 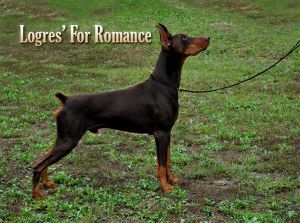 From that litter, only his son Logres’ Argentinus has been bred. 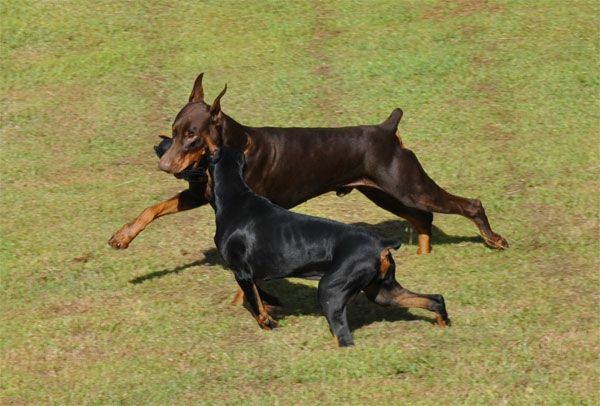 Argen is the sire of four outstanding puppies: Logres’ For Pleasure, Logres’ Jack Sparrow, Logres’ For Romance and Logres’ Black Caviar who are living proof of the superb quality of and enduring value of Ch. 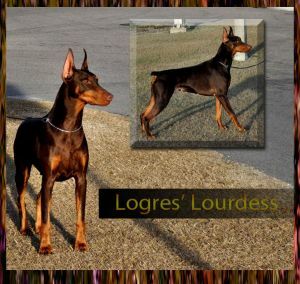 Logres’ Titanium. It’s been a bit over a year since Titan passed from my life. Time has been kind, there are only happy memories. 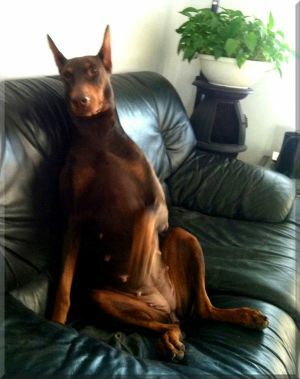 I feel him with me as I go about the daily routine of my life. 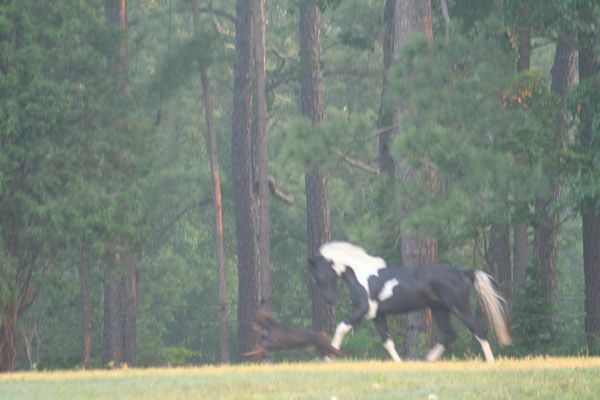 It seems that he is here, running the meadow or the fence line down by the mare’s pasture… The video below was taken this morning April 9, 2012. 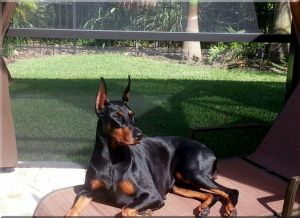 At times like these I think of Titan, of how much he loved life. 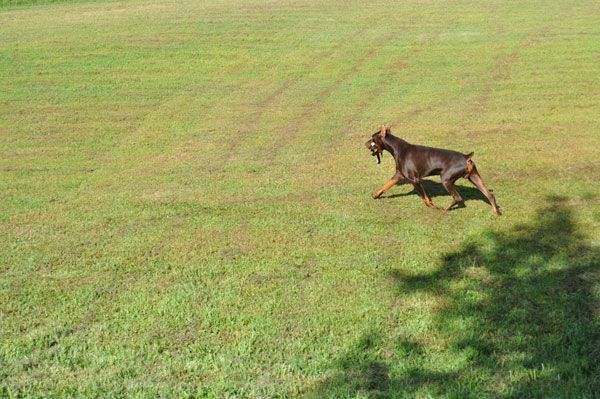 He is so much a part of this property. I miss him terribly but am comforted by the kids he left behind, each a bit like him, and yet each unique. 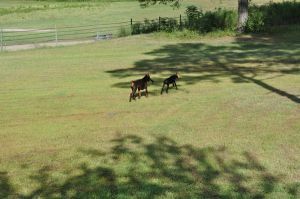 The video below is of Titan’s world and at the end of the video is his final resting place, under the tall pines, beside his brother Brentano and his mother Lizabeth.